Unsure of how to pick the hand and foot holds for an indoor rock climb? Try using chaos theory and a computer. The start of the 5.11+ climbing route Tony Yao set across the “Tsunami” wall. A view for a climber just about to start a route. Rock climbing is not on the list of sports at this summer’s Olympic Games in London. But for many Coloradans, rock climbing is a natural test of one’s athleticism—and wits. For one recent computer science graduate, rock climbing not only got him through school, but it became a topic of academic study. The basic goal for climbers at Boulder Rock Club is to make it to the top of the over 30-foot wall—and back down again—without falling. Of course, everyone is strapped into safety harnesses. But the real challenge is to scale the wall using only some of the hand and foot holds, following a specific route. 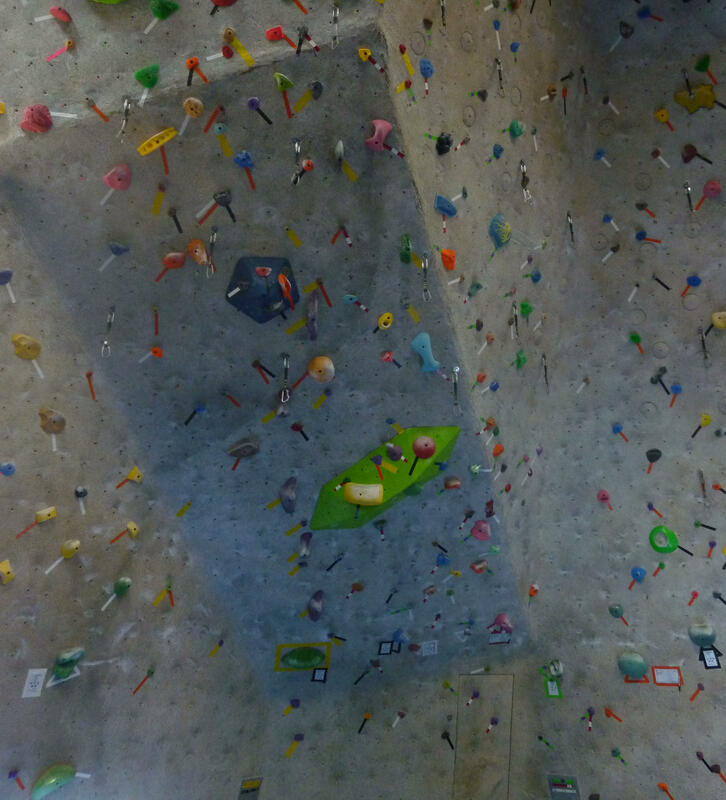 The “Tsunami” wall at Boulder Rock Club, the steepest spot in the gym. As head route setter, it’s Tony Yao’s job to create those climbs. One of his recent designs cuts across a section of wall known as the “Tsunami” that juts out at a 45 degree angle. A climb of this magnitude was certainly out of Caleb Phillips’s league when he got hooked on the sport a decade ago. But by the time Phillips was in graduate school at the University of Colorado-Boulder, climbing was part of his study routine. And that’s when the light bulb went off. Maybe math—specifically a field of math known as chaos theory—could help him use computers to design new climbing routes. "A lot of people, when they think about chaos, they think about randomness... but actually chaos is a very orderly thing." Phillips likens it to throwing a woodchip into a stream. Depending on where the wood hits the water, the path is completely different, but it’s also pre-determined. And because a chaotic system like this can be described mathematically, computers can produce these seemingly random results, which can be used to approximate human creativity. As a graduate student at MIT, Diana Dabby used chaos theory to compose music back in the 1990s. She started with an existing piece of music, like Bach’s Prelude in C from the Well-Tempered Clavier, and then used chaos theory to insert variation into the piece. Caleb Phillips took a similar approach, and started with an existing climbing route. But instead of changing the order of pitches, he had his program, which he named Strange Beta, alter climbing moves, like a left sidepull or a right match. To see if it worked, Phillips set up an experiment at Boulder Rock Club. Tony Yao and another setter designed two routes using the program, and two without. 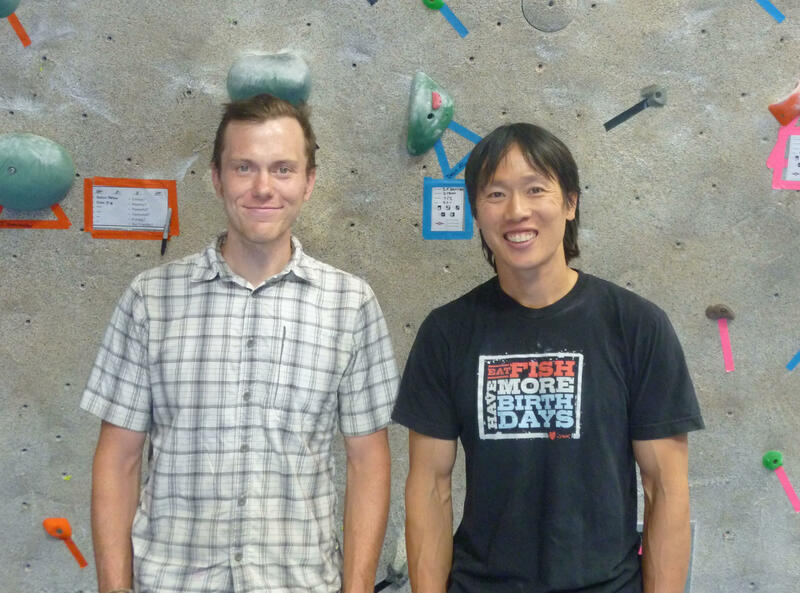 Caleb Phillips (left), a computer scientist, and Tony Yao (right), the head route setter for Boulder Rock Club. As with the Bach variations, not everyone was a fan of using science to make art—including Yao’s fellow setter. But the climbers, who were bribed with free t-shirts to test the routes, actually preferred one of the difficulty levels designed with the computer. For Phillips, that was more than enough. “The idea of injecting math or computers into the middle of that, and coming out with something that’s still pleasing and aesthetic, is a really interesting and exciting thing,” says Phillips. Since putting Strange Beta online, several hundred people have used the program. Right now Caleb Phillips is looking for ways to use that data to further refine and smooth out the suggested climbs. UNIDENTIFIED MAN 2: C plus S minus two.